TV Classic in neck of Tele too dark... Hum free options? Discussion in 'Guitars in General' started by james..., May 4, 2016. I love TV classics, but beside a regular Tele bridge pickup, they are dark as can be. I've tried it all. Lowering the pickup, pole screws, you name it. It's too bassy. I would put a regular tele pup in the neck, but hum offends me. First question - are you using a 500K volume pot on the TV Classic? It won't ever sound right if the volume pot is 250K. There's a way to have a single volume pot show as a load of 500K on one pickup and 250K on the other, if you need advice on how to do that let us know, here's one diagram. 1. Neck sees 500k (less tone circuit). Roe, drpoyer and rambleon like this. Lowering the pickup, pole screws, you name it. It's too bassy. Actually try the opposite. The lower you go, the more bassy/ muddy it will sound, and TV Jones pickups do best when they're really close to the strings. Check TV's website for recommended distance between strings and pickups. I have Power'trons in 3 very different guitars and love the way all of them sound. First question - are you using a 500K volume pot on the TV Classic? It won't ever sound right if the volume pot is 250K. Using your definition of 'right', Gretsches won't sound 'right' either. 500K isn't 'right 'unless you're using a master volume too. Gretsches use 500K, but they also use at least two in parallel (individual pickup plus master), so the pickup load from volumes is really 250K. No reason not to use a 500K here, but saying that "it won't sound right" is wrong in this case. FWIW, I have a Tele with a Magnatron neck pickup and it works really well. It's got 375K pots, by the way. I have one in my Crook and it's my favorite neck pickup in a T-style... you may want to experiment a little. I really like the DiMarzio Area T neck pickup's balance of meat and clarity. Hum offends you. So what pickup are you using in the bridge. I assuming it a noise-free of some sort. Why just get the neck counterpart of that? Honestly, I can't imagine a TV Jones Classic sounding dark when setup well. Maybe a little less bright than a typical Tele neck pup, but still nothing like dark. I'm thinking there's something wrong other than the pickup itself. 2 x TV Jones Classics - I would never have left the Tele bridge pup there - the bridge single coil pup is the worst thing about Tele's imo. Too squealy & thin sounding for me. 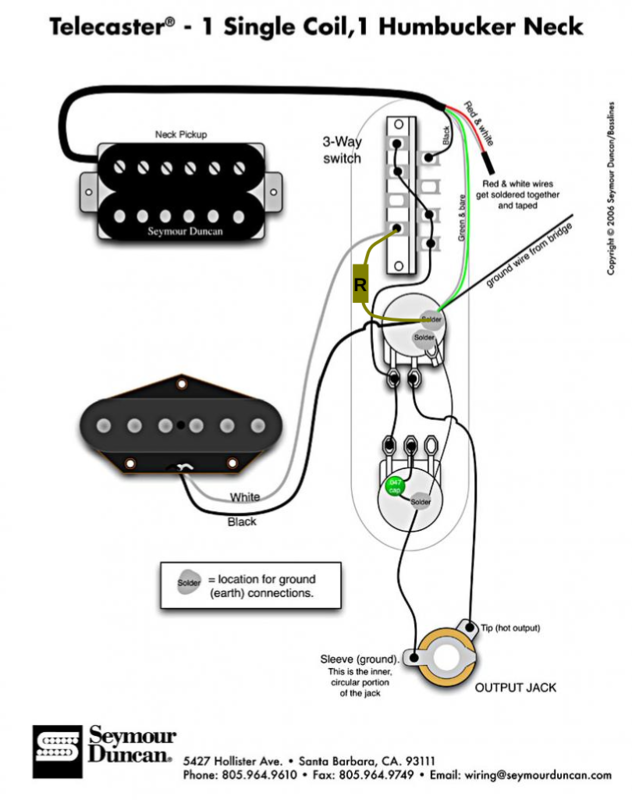 And there's often issues matching a single coil with a humbucker well in 250k wired guitars. So solution imo is 2 x TVJs & I'd change it to 500k while I'm at it. I would have put TVJ Classic Plus in the bridge & TVJ Classic in neck. That improves tone, makes it more versatile & solves the noise issue. I agree that the TVJ should not be dark. If you really can't make ot sound right then speak to Zhangbucker about a bright Firebird pickup. Um....are you sure you want a Telecaster? For most Tele guys (like myself) the bridge pickup is the BEST part! So I fixed this, kind of. 2.Placed a 470k resistor on the bridge pickup to make it 250K. I have two issues now. 1. While the neck and bridge pickups are now very balanced tonally, they also require me to turn the bass on my amps all the way down and turn treble way way up. On my AC15, I have to set bass and hi cut to zero, and treble to 10. Crazy. 2. I am now missing a ground somewhere. The guitar hums when I don't touch the strings. Ugh. You need to get the ground sorted out, and something is still wrong with your wiring - neither of those pickups should seem dark as a core tone. Maybe have someone else take a look at it? Or post a clear picture of your wiring here. there's one more cheap fix to try - put in a Reverend type bass contour control (google it, it's just a cap and a pot), or just put a .001 uf or a .002 uf cap on a DPDT on-on switch so it can be switched in and out as the last thing out of the guitar before the output jack - running the entire signal through a .001 or .002uf cap will cut some bass out of the signal, making the overall tone of the guitar seem to have more high midrange and treble. You can switch the cap in and out, one way the entire signal as it is now will go through, the other way the signal will go through the cap and lose some bass. Or if you never want as much bass as you have now, just try soldering one end of a .001 or .002uf cap on the center/output lug on the volume control and the other end to the wire to the output jack - then you'll always have some bass reduction. Try both a .001 and a .002, they're slightly different. Roe and cam.man67 like this. Agreed on the Reverend bass contour...I've put that in two very dark guitars over the years and have been thrilled with how it cleaned up a lot of that woofiness. Get a good single coil and an Ilitch to solve the hum. The rest of these are work arounds. But if someone gave me 1 first thing I'd do is swap in 2 TV Jones Classics & change the wiring to 500k. Tony Bones and SPROING! like this.